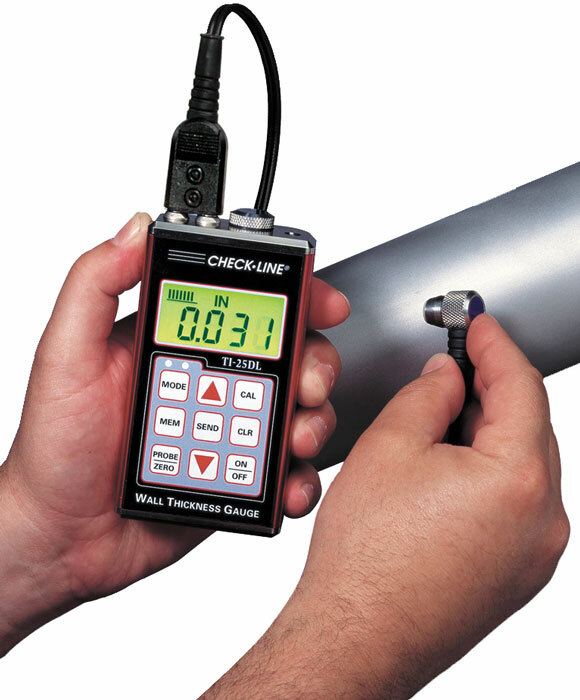 The new CHECK-LINE TI-25DL accurately measures wall thickness and the extent of corrosion of all metals, ceramics, glass and most rigid plastics - from only one side! The TI-25DL incorporates a built-in memory for 1000 data points that can be separated into 10 separate "batches." The stored data can be downloaded to a serial printer or a personal computer. A Windows compatible data transfer program is supplied at no additional cost. 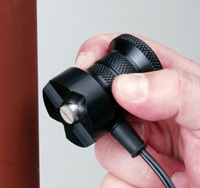 The TI-25DL is supplied as a complete kit with the gauge, probe, 4 oz. bottle of coupling fluid, 2 AA batteries, NIST-Traceable Calibration Certificate, data transfer software, RS-232 output cable, RS-232 to USB adapter and Operating Instruction Manual - all in a foam-fitted carrying case. Replaced by TI-25DLX Data Logging Ultrasonic Wall Thickness Gauge WITHOUT PROBE.